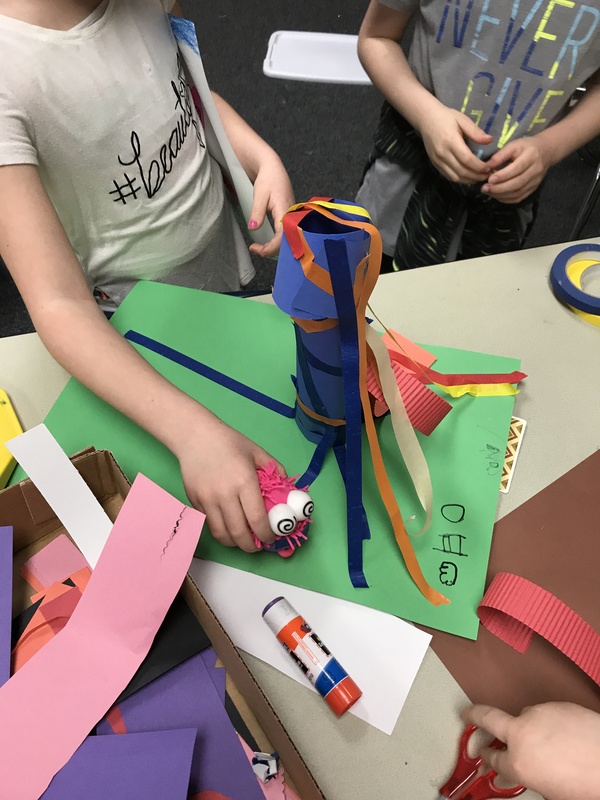 Kindergarten is always an adventure in the art room, but can you actually get them to work quietly? 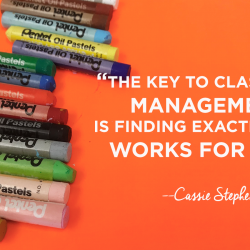 Cassie is pretty sure you can, and she’s going to tell you how to do it! Listen to today’s episode as she talks about the quiet critters strategy (3:30), why it is so motivation (6:00), and opportunities for tying in art history with the strategy (10:45). Full episode transcript below. For my sanity’s sake, I like to ask that my students work quietly in my art room. We sometimes listen to music. I love to read chapter books aloud. I’ve been doing a lot of that lately. It just creates this nice, calm environment. 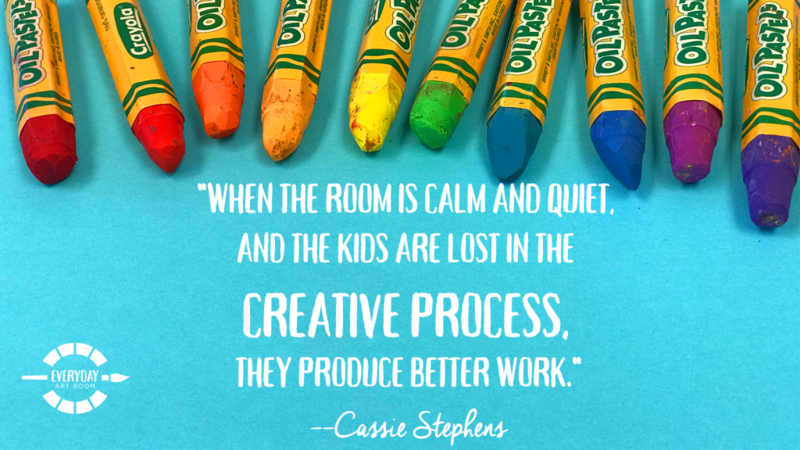 I have noticed the when the room is calm and quiet and the kids are lost in the creative process of making their masterpiece, they produce a lot better work. That’s my expectation for my students in first through fourth grade. Now, as you might recall, I also teach kindergarten. When kindergarten comes to art class, pretty much that rule gets tossed out the window. But not for lack of trying, you guys. I mean, it’s just about anything I can do to get those wee little cherubs to work quietly and they just can’t. They’re just so loud. Or at least that’s what I thought. So a couple of weeks ago, I happened to be walking down the kindergarten hallway and popped in one of my buddy’s rooms and the kids were in there working calmly and quietly. And I said to the teacher, “What is going on? Are they in trouble? Are they always like this? What’s happening? And how did you do this?” She was looking at me as though I were crazy and she said, “They’re just working. This is just how they work.” Say what? That is not just how they work in my art room. When I saw that I knew I had to make a change for my sanity. And I’m gonna share with you this little magical thing called quiet critters that have invaded my art room and forever, at least for now, knock on wood, changed the climate of my art room when kindergarten comes to art town. I’m Cassie Stevens and this is Everyday Art Room. So I’ve chatted about kindergarten previously and I have shared with you how to “tame the kindergarten beasts.” So if you’re interested in hearing me chat more about kindergarten, even though I’m pretty sure you’re probably like, “Well why would I? You just got done saying they’re crazy in your room.” Regardless, episode number six is where I talk about taming the kindergarten beasts. Now what I’m about to share with you today, these quiet critters, this is not something I do with all of my classes, just kindergarten. However, if I had discovered this earlier in the year, I might have actually tried this out with my first graders and even up into my second graders. I think that they might have been into it. But I do a slightly different system with my first grade through fourth grade that already works great. In fact, I chatted about that in episode 17. It’s called the Blabberbrush. So I’m not about to go about fixing something that’s not broken. However, the noise level in my kindergarten class was just too much for me. So it was something that needed to be fixed. The quiet critters idea is not an original mine, it came from one of my favorite Instagrams to follow. So get your phone ready or grab a pen. It’s art_with_mia. Fabulous art teacher in Saudi Arabia. She’s a little Irish girl who teaches there and she has such a fun Instagram. And recently she posted a picture of pom poms with eyeballs glued to them and she described her process of how these are her quiet critters. Simply, it’s a little whatever, sparkly shiny something something that you can place on the hardest and quietest working tables in your room. That little sparkly something something can only stay if the table maintains that level of quiet. So that’s just the overall jist of it. And let me just tell you how it works in my room. I happen to be at the HobLobs, or otherwise known as Hobby Lobby where they had pom poms, sparkly pom poms that were about the size of my fist and they sold them in a pack of four. So I just happened to pick them up with Mia’s idea in mind, took them back to school where I have a plethora of googly eyes, as every one of us does and we don’t know why. Where do they all come from? And I also have sparkly pipe cleaners and I just went to town with my hot glue gun. Glued one eye on one, a couple eyes on another, glued one with one big eye and one little eye, added the little pipe cleaner for antennae, I even cut out a couple of little felt feet. And while I was standing there at the hot glue gun area doing this I thought, I don’t know how this is going to go over. They’re either going to buy this hook line and sinker or they’re going to be like, “This is crazy, Stephens. We’re just gonna go back to being loud and proud. Thank you.” Okay so when they came in I was done giving directions and then I got really quiet. I leaned in really close and I brought out a glass jar that was filled with the quiet critters, which already got a “Ah” from the kindergarten audience. And I leaned in really close and I turned my voice down as low as I could so they could still hear me and I said, “Guys, these are the new pets of the art room. These are the quiet critters.” And I pulled each quiet critter out of the jar explaining that the quiet critters can only go to the tables that are working so super quietly. The reason they’re in a glass jar is because when I’m giving directions, they’re going to sit and watch you, just to make sure you’re listening so very nicely and quietly. It totally worked. I told them the names and introduced each quiet critter to them as they were still sitting with me on the floor. And I decided to name each one of the quiet critters after an artist. I’ll tell you why in a moment. So I’ve got a Bob for Bob Ross, an Andy for Andy Warhol, I’ve got a Vincent for Mr. Van Gogh, I also have a Freida as well as a DaVinci. I tried to make sure I had enough quiet critters so that I could definitely place one on every table in the room if they earned them. After I introduced them, I told them exactly what was going to happen, how once they were at their seats working, if the quiet critters noticed they were working quietly, they would whisper to me which table they wanted to go to. So I sent the kids to the store, which is where they go and gather their supplies and the whole time, guys, the whole time, they’re turning back around starring at that jar to see if the critters are watching them. You could have heard a pin drop. They tiptoed to their seats, they settled in, they got started quietly. It was bananas. Nobody shouted out my name, nobody had their hand up, they were just intent on making sure one of those quiet critters was coming to their table. So I waited a beat I let them get settled, made sure they were going to actually be working and not just starring at my little glass jar. And that’s when I leaned in close to the jar pretending that something was talking to me and I calmly and gently took one out and I tiptoed to whatever table that was working quietly. And at this point, they all were. And they watched those kids get the first quiet critter. I placed them in their caddies so that their little quiet critter could watch the entire table. And then I went ahead and placed it on every single table and they just kept working so quietly. Now I do have one table in one particular kindergarten class that forgot. They turned their voice on, not even whispering. It was like a full blown convo and I just went over and I said, “Oh you guys, I’m so so sorry. But your quiet critter has just told me that it’s no longer quiet at this table so he’s going to have to leave for a little while until your table’s quiet again.” And it worked. In fact, the other day I had four art teachers in my room hanging out and observing and they could not get over how well this little trick worked. So super simple, super easy and here’s how I’m thinking about building on this. You know we always have those tables where there’s a group of kids working really quietly but there’s maybe one or maybe two where either they just can’t not be chatting because after all they are five, or they just don’t have a strong handle on self control. But it’s not fair to the other kids at the table who do. So I went ahead and I bought smaller sparkly pom poms and those are going to be for my individual students who happen to be working extremely hard or very, very hard and quietly that just happen to be sitting with other kids who might not be able to. That way it rewards those kids who are working so quietly. So like I said, my friend art_with_mia shared this idea and apparently, get this y’all, apparently this idea is not a new one. Apparently classroom teachers have been doing this all along and keeping this a secret from us. I’m telling you, we all need to venture into those classrooms every now and then, find that one classroom teacher who you really admire and ask if you can sit in on his or her class. Because you will learn a ton. And it’s also amazing to see kids in a different environment, to see how they interact in their classroom setting and then when they come to your room you can be like, “All right I’m on to you guy.” Or be just impressed that they actually are maybe a better version of themselves when they come to you. So here’s the little story about why I’m naming the quiet critters after artists. I mean an obvious artist tie in, so the other day I told them at the end of class that as a special treat they were going to be introduced to one of the artists who their quiet critter was named after. So I decided to go with DaVinci. And I happen to have a very large thrift store frame. I’ve had this for years and I painted Mona Lisa on the frame and then I cut out Mona’s face so that when I hold up the frame I can poke my beautiful face right through. It is absolutely frightening, definitely the stuff of nightmares. And in fact, I posted a video of this experience on my YouTube channel. So if you’re curious to see what I’m talking about, you can find it there. Don’t worry, it’s really short because that’s all one really needs to see. So at the end of class I just went into my office, I put my little face through the Mona Lisa frame and I spoke like this. I was painted by Leonardo DaVinci, the artist who one of your quiet critters is named after. My hands are sweating doing this really miserable Italian accent for you so my apologies. Especially if you happen to be Italian. So the kids went nuts. They thought it was so amazing that the next week they were like, “Oh which quiet critter are we going to learn about this week? Of course I was completely unprepared but since they were so thrilled with it I did go over to the thrift store this weekend, purchased another frame and this week they will be learning about good ole’ Vincent. So there you have it. A great way to tie in an artist as well. Quiet critters, probably the easiest, the cheapest thing. I want to know if you give it a go because you know you’ve got pom poms and googly eyes or just about anything, even a stuffed animal, sitting around that you can use in your art room. And if you do it, I want to hear about it. I definitely want to hear if it works. I have to tell you really fast that I have this one sweet delightful little kindergarten boy named Cortez who is absolutely, positively in love with his quiet critter experience. He brings me drawings of the quiet critters all the time. The other day his kindergarten teacher, they were having a little chat about their most favorite thing at school. Cortez’s favorite thing, the quiet critters because it’s sparkly and awesome and you have to be really quiet in order to get one. Who knew it’s the little things that work with the little people, guys. I am telling you. All right. Thank you so much for letting me share all about the easiest thing you could possibly do to get those kids calm and quiet, quiet critters. Tim Bogatz: Hello. This is Tim Bogatz, host of Art Ed Radio. Thank you for tuning into Everyday Art Room. If you’re looking for graduate credits in the next few months, make sure you check out theartofed.com under the courses tab. 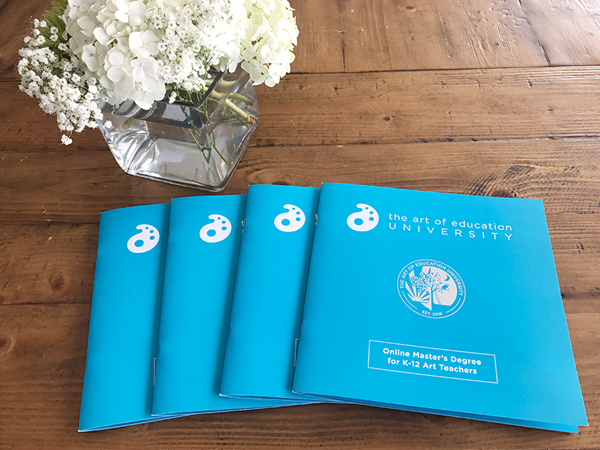 We offer over 20 online courses designed to help art teachers at every stage of their professional career. And since we’re talking kindergarten today, let me suggest AOE’s Rethinking Kindergarten course. 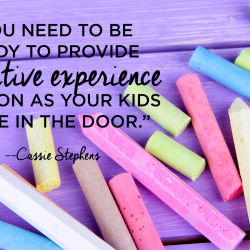 It will give you a variety of strategies, tools and methodologies sure to support the budding artists in your kindergarten art room. This four week course is worth two credits and has new sections starting at the beginning of April and the beginning of May. 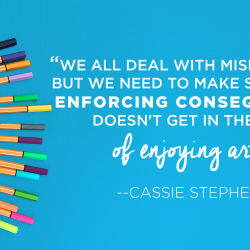 Check out Rethinking Kindergarten and all of our courses at the artofed.com/courses. Cassie: Now it’s time to take a little dip into the mail bag. I’m going to take several questions today because they have some pretty quick and easy answers. So this one comes from Sylvia. She is preparing for her Artome art show, which I believe I chatted about just last week. It’s a fundraiser. If you want to hear more you can, of course, simply Google Artome or you can listen to the mailbag of last week’s chat. So I always have suggested using Aqua Net hairspray as a fixative. It’s really, really cheap and it usually does a great job. But I have experienced the same splotchiness with hairspray. So I don’t know if it’s now time to go back to the more expensive, legit fixatives or if perhaps it is a good idea to try out a couple of other hairsprays. Something about the way the hairspray is coming out, it does leave little speckles and I have noticed that on my student’s work. But I will tell you this, it dries slightly speckly but not enough that if you weren’t aware that it didn’t look like that before, it wouldn’t be noticeable to you. Meaning I’ve never had parents not purchase this masterpiece. It still looks gorgeous and beautiful, just slightly dulled in color. So for that reason, I still use the Aqua Net hairspray, I just hold it at a much further distance in hoping that the speckles kind of spread themselves out a bit. So I hope that answers your question, Sylvia. And perhaps if you guys know of a fixative or hairspray that you have found to work really well, you can let us know in the comments. My next question comes from Amanda. Amanda says, “I was wondering what type of document camera you use in your classroom? I’m wanting a better one for my room and I’m trying to get as much info and recommendations as I can.” So I actually get this question a lot. In my art room I don’t have a Promethean board because I’m an idiot. Back in the day when they were saying, “Who wants a Promethean board, raise your hand.” I’m, believe it or not, really anti-technology, despite the fact that I have a blog and I do a podcast and blah, blah, blah. I just don’t love having tons of tech in my art room. Don’t get me started, I’m just going to put it there, the end. Period. Moving on. So I had this idea that this was going to be a tech that I wouldn’t want. Now I kind of regret that choice. But I did get an Elmo, which is what I have as a document cam. My Elmo, I absolutely love it. I feel like the colors are pretty close to reality. Sometimes I either have to turn the light on, it comes with a little light, or turn it off depending on what it looks like on TV. But I have my Elmo connected to my very large screen TV and I don’t know what I did without it. I mean, back in the day, I would have to do all my demos on an easel or have my kids gather around a table, which just as all sorts of annoying. “He’s stepping on me, he’s pushing me, he’s too close to me, he’s breathing on me.” You get the point. So my Elmo, I absolutely love it and that’s what I have so that’s what I would recommend. The next question comes from Melissa. Melissa has a question about clay. She says, “I am planning to run a week long clay camp this summer and I’m interested to learn more about how you do one kiln firing with clay pieces.” So I’m a little concerned about this one. Here’s why, Melissa. If you’re going to do a week long clay camp, it’s going to be pretty tough to make sure the clay pieces are dry enough in time for them to be fired in a kiln. However, you did say it’s a summer camp so perhaps the heat and humidity will help the drying process. But you also want to glaze it. So let me think about your options. If the kids make something out of clay, or when they do make something out of clay, kiln fired clay, they could, as soon as they’re done making it while the clay is still wet, they can go ahead and glaze it with Maccos Stroke and Coat. In fact, don’t take my word on this, but I would assume that most low fire Cone 06 glazes can be used this way. If you do, and I’ve done this in my art room where we’ve made it and glazed it all in one sitting, if you do this, just know that the colors are not going to be nearly as vibrant because as you’re painting on that clay piece, the glaze is mixing with the clay creating something called an ingoble. I hope I’m pronouncing that right. Clay people are probably going to attack me. But that is basically a slip kind of a glaze. So your pieces are going to be more pastel in color and definitely not as shiny. So knowing that, what I have done in the past is, after my kids make it and glaze it in one sitting, after it’s dried sometimes I’ll either slap a layer of clear glaze on top, just to make sure that it’s nice or shiny. That won’t enhance the color, that’ll just make sure that it’s nice and shiny. That being said, I would try really hard to have those pieces done on that very first day so that they are ready for a firing perhaps, let’s say if you start on a Monday, perhaps on a Thursday. In the meantime, what could you do with your camp? Well, you could do a variety of air dry clays or the kids could make their own clay. In fact there’s a really good clay book, it’s called 52 Clay Projects for Kids and it was written by yours truly. So you might want to look for some alternatives to kiln fire clays, especially going to be working closer to your deadline. Great question, Melissa. All right, let’s see if we can squeeze in one more question. This one comes from Teresa. Teresa says, “You have written so much on your blog about growth mindsets. Do you have a suggestion as to where to begin?” So I had big aspirations the beginning of this school year to really bring growth mindsets to my room. And I think I made it more difficult than it necessarily needs to be. I think that when you are introducing artists or introducing any method of creating to your students, you can encourage some character words and some growth mindsets. For example, I have recently been introducing my students to Vincent Van Gogh and I shared with them that despite having painted 900 paintings in his lifetime, he only sold one. And we talked about how that would make us feel. And of course, we talked about how we would just give up, we would throw in the towel. And then I introduced them to the word perseverance. In fact, there’s a video of me teaching them that on my YouTube channel. And I feel like that is a way where you can comfortably start introducing growth mindsets without making it so difficult for yourself. I feel like a lot of times I hesitate to do or introduce new things to my students because I make it too big in my mind. I feel like I have to follow a strict program or do it in a very specific certain way. No. You just start doing it. And you go with it and you kind of see what works. But I will say a fabulous books, one that I strongly recommend, is called The Growth Mindset Coach. It was written by two amazing teachers who’s names are escaping me. However, if you Google the Growth Mindset Coach, you can find the book. I believe at some point they were coming out with a playbook to kind of give you more in depth lessons and that might now be available. So definitely look into that if you’re wanting to introduce growth mindsets to your students. And all right, I’m going for it. I’m answering one more question. This one’s from Lindsay. So Lindsay has a question about the insane rainbow scarf that I recently knitted. She says, “I have a question about your scarf. Did you use circular knitting needles? I’m trying to wrap my head around how you didn’t lose any stitches.” Oh girl, I dropped all sorts. “From casting on so many and your needles are smaller than mine.” So, okay, this scarf, I wanted to create a rainbow scarf but I wanted … If you’re a knitter, even if you’re not a knitter because I’m not, just bear with me as I explain this. I wanted the rainbow to run the length of the scarf. I did not want to have it be patches of color. I wanted it to be the entire rainbow when you saw it. That being said, I knew that I would have to cast on all red and then knit a couple of rows of red and then knit a couple of rows of orange. Every time I decide to knit, which is once every other year, because it takes me that long to remember how much I absolutely hate knitting. So every two years I have to pick up my kid’s knitting book to refresh my memory. My book I would recommend is by Klutz. It’s how I learned how to knit after looking at many, many books. It’s awesome. And I use needles on the round, meaning they’re needles connected, simply because that’s what I always have used. When I took a class, that’s what they tried to teach me on. It didn’t work. Anyways, so I cast on and the key with casting on when you’re knitting is you want to count how many stitches you’ve cast on. I didn’t. I just started knitting like crazy and because the needles were in the round and it was all scrunched together, I couldn’t actually tell how mammoth this thing was going to be until I cast it off. And my rainbow scarf is probably longer than 12 feet. It’s a monster but I love it. In fact, I was showing it to my students and we could wrap the entire class in this scarf. It was pretty amazing. So anyway, Lindsay, I don’t know if that helps you out but I don’t know if you actually want to do what I did because it is bananas. If you guys have any questions, please feel free to throw them my way. You can find me at the Everyday Art Room at theartofed.com. So who wants to go in the quiet critter biz with me? I have a feeling that if we marketed these, especially to parents, we could be bagillionaires. If you want to go into business with me, you just let me know. Quiet critters, maybe we can come up with a different name. Hush your mouth monsters, time to be quiet now ’cause Mama’s trying to sleep sloths, we’ll think of something. Call a girl. Anyway, thanks guys, so much, for joining me today. And for following me along on all of those mailbag questions. Keep them coming, I love to chat with you all. Thank you for sharing. I have used something similar the past several years. My tiny little finger puppets are called “Table Watchers”. The finger puppets of dogs, bunnies, monkeys ect. join quiet tables to watch them create masterpieces. A table can earn more than one “Table Watcher” and they continuously move from quiet table to quiet table. A quiet table uses a whisper voice to share and communicate ideas! Its fun so see a student’s expression when the “Table Watcher” they have been hoping for joins their table. “Yes, the lady bug is watching me!”. Or, “I can’t wait for the frog to see my van Gogh painting!”. I love how you tied your critters to an artist. Mine are just classroom pets! LOL. Hi one of our art teachers just shares her quiet critter at our dept. meeting. I was so excited! Going to make a bunch this weekend (I have 2 rooms) Thanks for sharing and inspiring!!! I was inspired to try out the quiet critters with my K-2 classes. I call mine the castle critters and they live in this basket with a castle on it. The castle critters like two things. They like it to be clean and quiet. 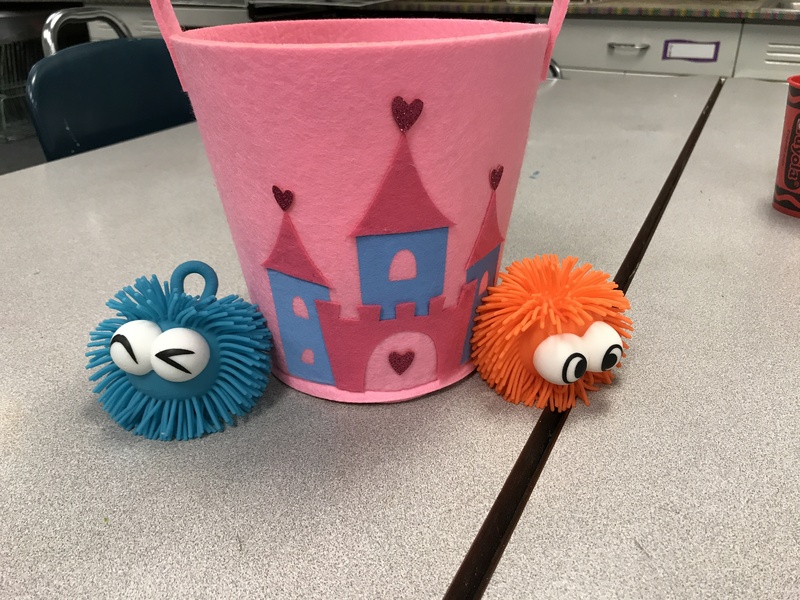 The students have been motivated to be cleaner and quieter since I introduced the castle critters a couple of weeks ago. They have even created art for the castle critters. I found the basket and the critters at Dollar General. https://uploads.disquscdn.com/images/29bd31ca3cbc288bcfd49ce5caa143d0cdbe1742de0d096bf9c2cb02712102a7.jpg I found the basket and the critters at Dollar General.